All on-street advertising boards will be banned from Edinburgh by the Autumn after councillors agreed to remove the obstacles. Members of the city council’s Transport and Environment Committee unanimously agreed to a citywide ban on the street clutter as an “equalities issue”. 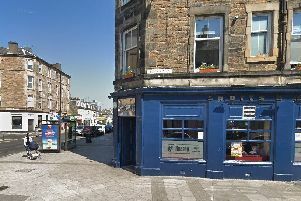 The Royal Mile is continualy blighted by the boards on the footpath causing peadestrian congestion and an ugly eyesore. The committee heard from its equalities champion, Cllr Derek Howie, who spoke about his experience of walking around the city with his guide dog. He said: “Edinburgh is a busy capital city, it’s thriving, it’s booming. We have many people wanting to come and live in Edinburgh - that means a lot of people in a finite amount of space. “We are facing a situation where the streets are immensely crowded. We have to be inclusive. It’s not a city just for the fit and able, it’s a city for everyone. An army of enforcement officers will be recruited by the council to make sure the ban isn’t flouted, not just in the city centre but across the Capital - and there could be potential to issue fixed penalties to those who don’t adhere to the ban. Officers have received complaints in the city centre, but also far and wide including Portobello and Gorgie. The committee also heard from Justin Davis from Edinburgh Pub Crawl, who asked for help to be given to businesses, and in particular, walking tours. He said: “Whilst we recognise the city wants to remove all the temporary advertising, we want to consider that you are absolutely sure when it happens, it does not harm businesses. He added: “We understand the importance of removing the boards - it’s becoming a bit of a free-for-all. Conservative Cllr Nick Cook, asked whether the ban would apply to a-boards outside polling stations at elections. The issue will be looked at. Cllr Cook added his support for the ban. He said: “This is a significant piece of work that could make a huge difference to the city. The council hopes to put the ban in place by the Autumn, and will look at ways businesses which are potentially effected by the ban, can be helped - as well as specifically looking at walking tours. Convener of the Transport and Environment Committee, Cllr Lesley Macinnes, said: “It’s absolutely clear that we are very aware of the potential impact on business and we are very aware of the need for mitigation. “We should not, however, forget the purpose is an equalities issue”. Labour Cllr Scott Arthur, highlighted whether the council’s own street furniture should be looked at. He said: “I welcome the fact this is a citywide ban. I think pedestrian safety should be our priority rather than business. Blindness charity RNIB Scotland has welcomed the decision. The charity’s chairwoman Sandra Wilson, who is blind herself, said: “While we want businesses to prosper, our streets should not be an obstacle course to be negotiated. “A third of blind and partially sighted people surveyed by RNIB said they had been injured by pavement clutter when walking outside. Some felt so intimidated they ended up staying isolated in their homes. This is surely unacceptable. She added: “A-boards are a particular hazard. They appear without warning, there’s no consistency on where they’re placed, then you walk into them, either hurting or injuring yourself or ending up with a bill for the dry cleaner or the garment repairer.